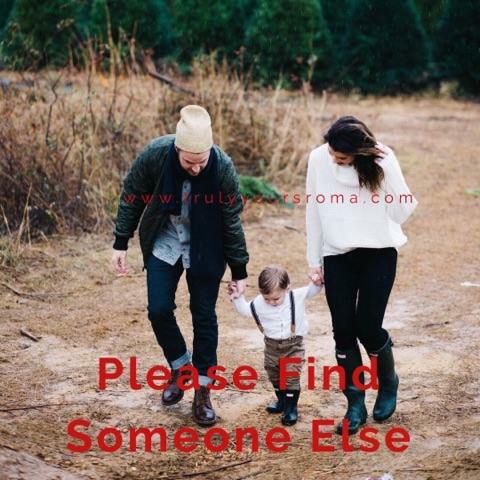 One funny or rather not so funny thing post our marriage has been that we had for a valid reason always of course changed more number of houses then the number of years we have been wedded for. 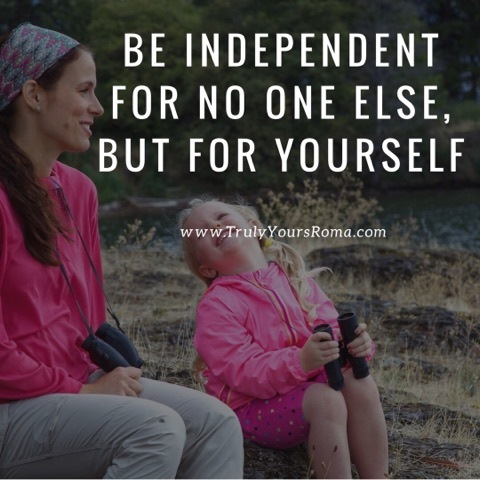 Job changes, dream to move into our own, mommy-hood and many other reasons have literally made us impressively adaptable nomads😄. It isn’t difficult for I have long back learnt to disassociate my emotions with the place we dwell in, being a banker’s daughter who was frequently transferred. 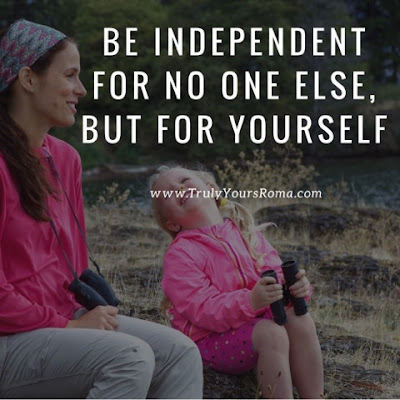 While it is easier said than done for no matter what I say, an emotional person like me associate a lot of value to my home sweet home. 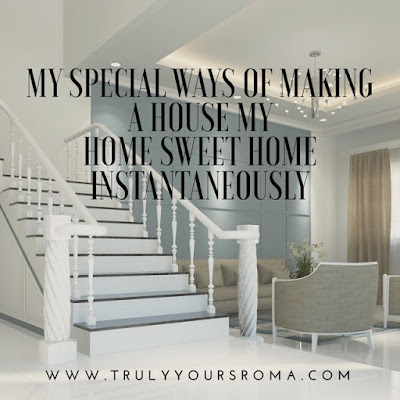 Many years ago, not only emotionally, I used to invest financially a lot too to beautify our abode and make it the best place to come back to and cosy around with your loved ones and thus when I left that place, I deliberately left behind many of my favorite pieces there lest my last home would look deserted and desolate when we were gone. But with time I have grown pretty smart. Now, I style my every home without burning a hole in my pocket and still in a way that is so close to my heart. 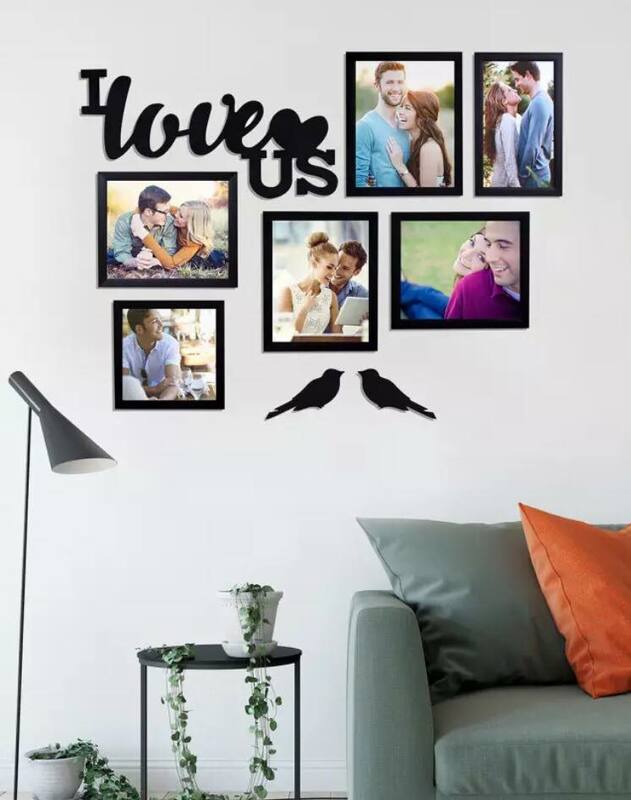 Well, you all know how I love to weave sweet memories by clicking billions of pictures and I do the walls of my home framing these memories in a creative personalised way in exquisite Photo Frames. One of my favorite places to pick these artistic Photo Frames at unimaginably value for money prices is Myntra. 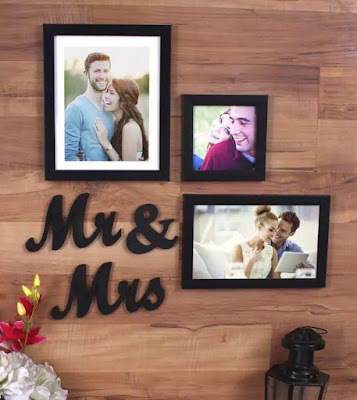 These photo frames pretty much adorn seamlessly almost all the main walls of my home and are beautifully packed and carried when I need to move. I really love how some of the designs like the tree one satiate the nature lover in me and help me theme my rooms. 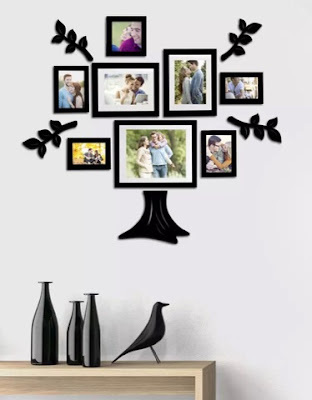 We can as well use it to showcase our family tree with some pretty pictures of our grandparents too. 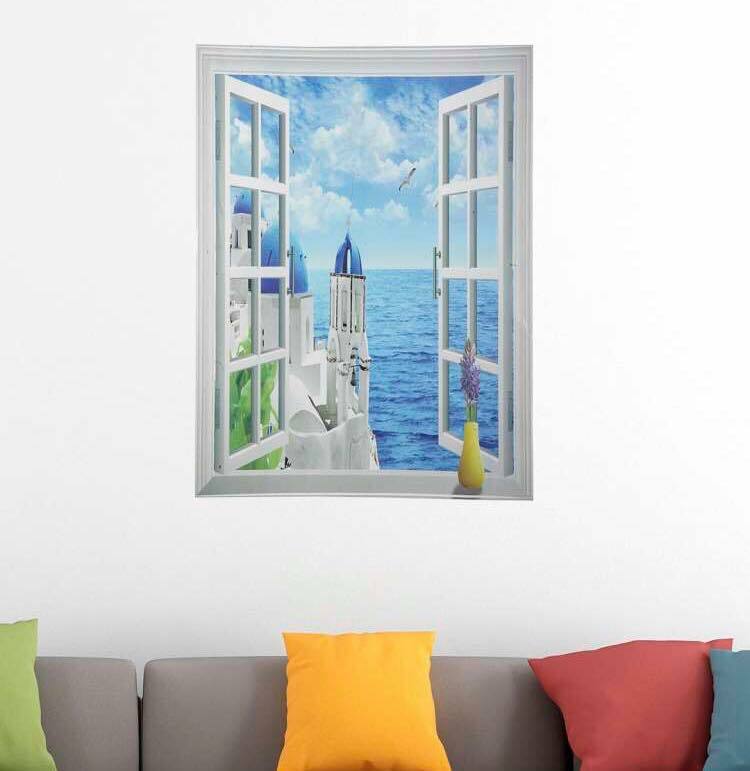 I am never short of ideas with these frames. 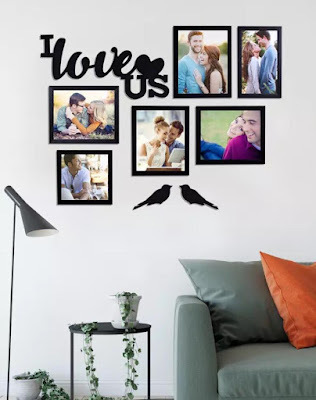 What I also love is I can play around with the frames to arrange them in different settings and always render a new look to my home without a single penny spent. 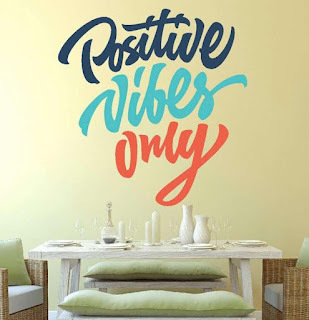 Another thing I love to adorn the walls of my abode with are Wall Stickers, how they infuse a new zeal of life in the otherwise morose walls. 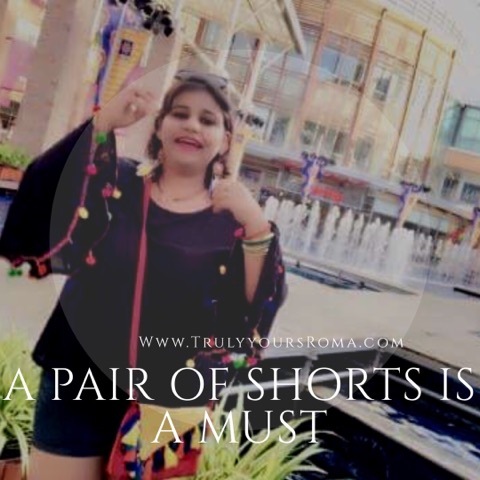 At unbelievably low prices there are a humungous number of options available at the same source, Myntra which remains my forever favorite. You can choose the wall stickers of paintings, of hearts, of slogans and some colourful adorable ones too for your little ones room. I love the fact that I now don’t need a painter to paint my mind on my walls to make it my home sweet home. I just order the wall stickers or decals as they call it and use the technique mentioned in it to do it myself and am now a pro at it already. Initially I left a couple of bubbles will doing a walls but you can easily prick them with a pin unnoticeably to get the perfect finish. 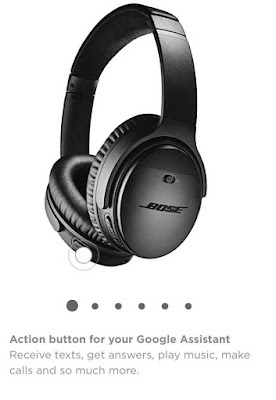 So these are my two new hottest favourites to do my houses my own special and smart way at almost negligible cost and loads of personalised feel. 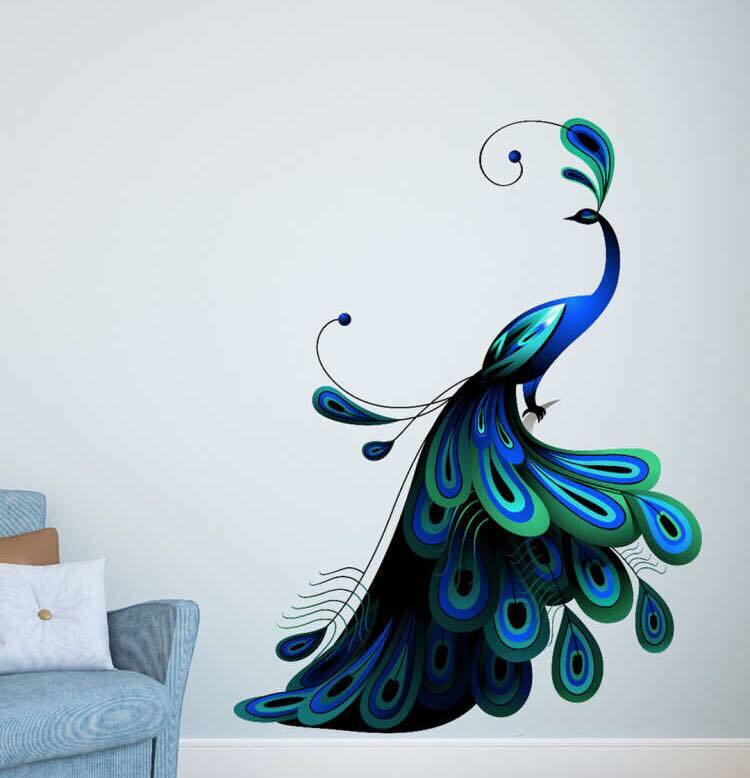 I like doing a combination too sometimes, like may be a slogan wall sticker for the dining room, a couple of hearts for our bedroom, a scenery for the drawing hall and yes may be a peacock for my library😊. 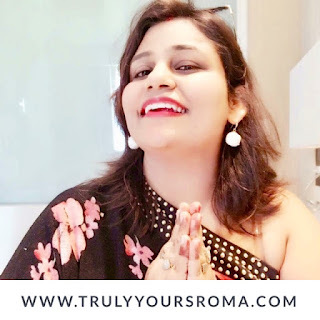 Truly Yours Roma loves having colours all around and highly recommends these two ways of giving your home sweet home a new lease of life personalised only for you and your loved ones ♥️ ,no matter whether you have to redo your abode or are moving to a new one. No matter what people say of it, Valentine’s Day is a festival in my home and we celebrate it in a little special way each time reliving the old priceless memories and weaving the new precious ones. 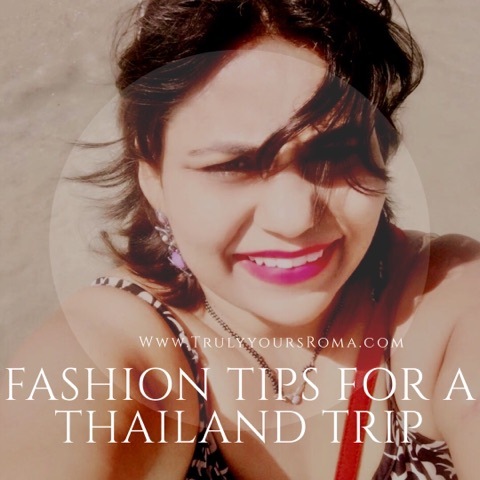 While it is very easy to choose a gift for the more flamboyant me, it isn’t that easy to pick one for the choosy and classy hubby. Probably good watches and mesmerising fragrances are the two things he loves the most. While I was contemplating what to gift him to enrich his already rich collection, some exotic beauties straight from Paris landed at my door. 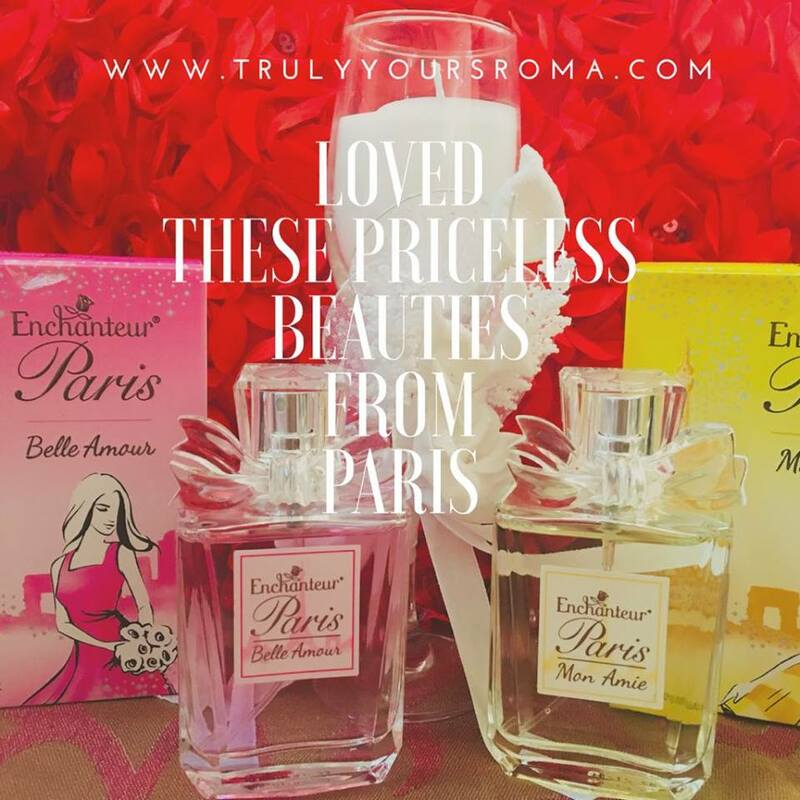 They were the French Perfumes from Enchanteur, a global leader in Perfume Industry which has created its mark in more than 50 countries all over the world and is now in India. 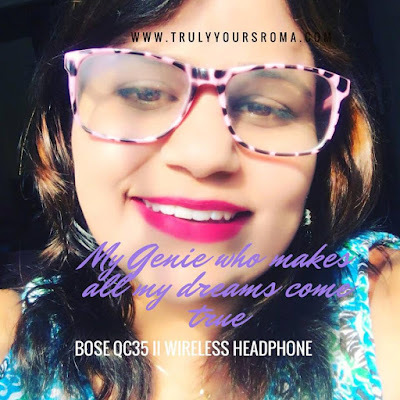 There website is www.enchanteur.in and in case you wish to purchase one, I have a little something for you this Valentine’s Day...you may use coupon code - ROMA to avail a flat 20% off on all their products. Could if get better♥️? Though I wasn’t sure if these elegant packs held perfumes which were for men or were feminine, I thought I must quickly review them for all of you right here, this valentine season. The products I review in this post are their new enchanting range known as ETDs (Eau De Toilette) ~ Enchanteur Paris Belle Amour and Mon Amie Fragrances for you. These beauties were truly love at first sight for me. 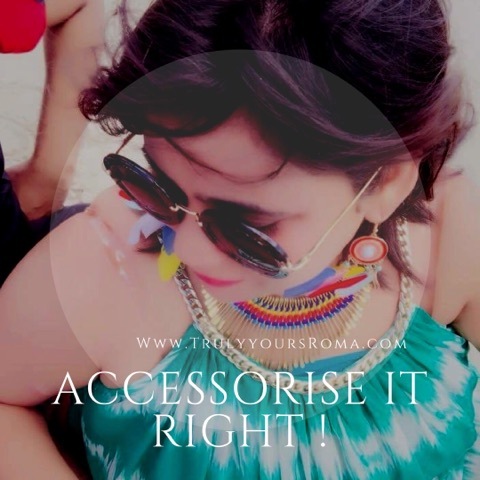 First things first, the packaging of these products is pretty chick and soothing and makes it not only ideal for self use but also a perfect gifting option no matter what the occasion is. The inside cute rectangular bottles with a bow at the neck and Eiffel Tower at the top stole my heart at the first glance and I decided not to gift it to hubby but keep it for myself (grin :D), so you know how adorable they are. 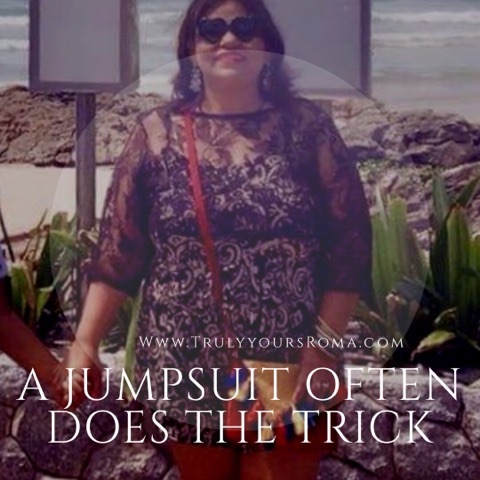 Also there size is just right to fit in my handbag which is such a necessity in me. Another significant point which leaves me impressed(as I am a pretty environment conscious person) and so I am mentioning the same right at the start is that all these perfumes are ozone friendly. 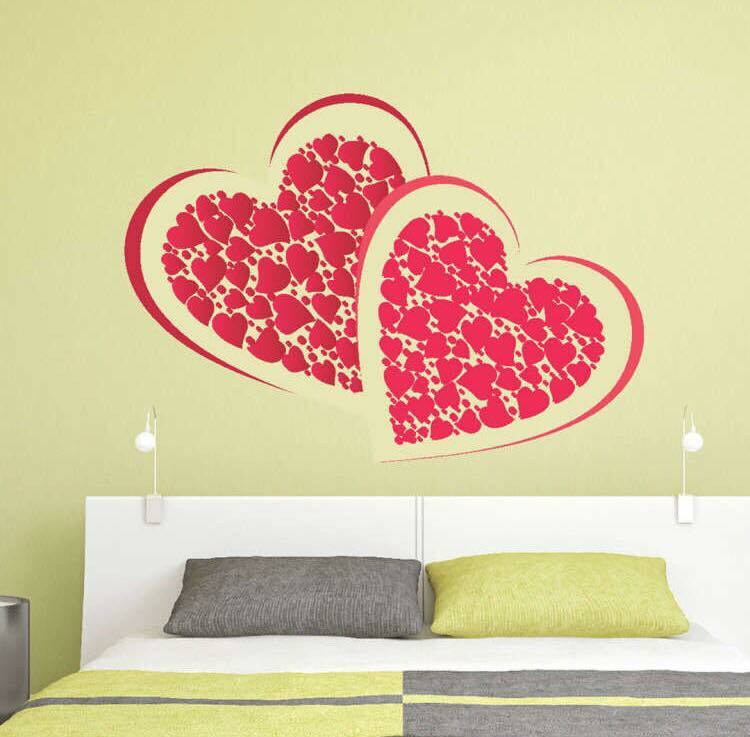 Out of the two, Belle Amour which means Beautiful Love in French is my favorite. It’s lovely blend of Apple Melon, Blackcurrant and Parisian Pink transports you to a different world or course with your love. The fragrance is extremely soothing and captivating and enthrals you. Much to what I really prefer, it isn’t very sharp or staunch and is gentle and serene. This beauty from Enchanteur Paris is definitely going to remain my priced possession for a long time. On the other hand if you love fruity smells, Enchanteur Paris’ Mon Amie meaning My Friend is absolutely for you or to gift to your best friend as a unique gift of true friendship. The fragrance is strong, attracting and fresh citrusy and also has smells of Red Apple and Pink Peonies...this fragrance surely can make heads turn on. So go paint the town red and leave your mark with it. Now comes their pricing. 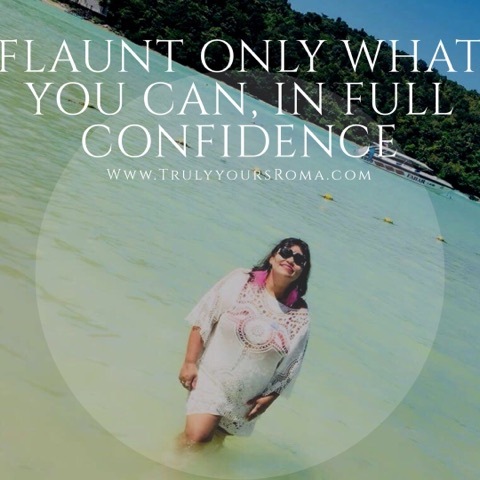 Unbelievably, both the above products are priced at only 750 INR each which is a fair price in my eyes for this perfume and like I told you above you can avail a further 20% off if you use coupon code - ROMA on their website. 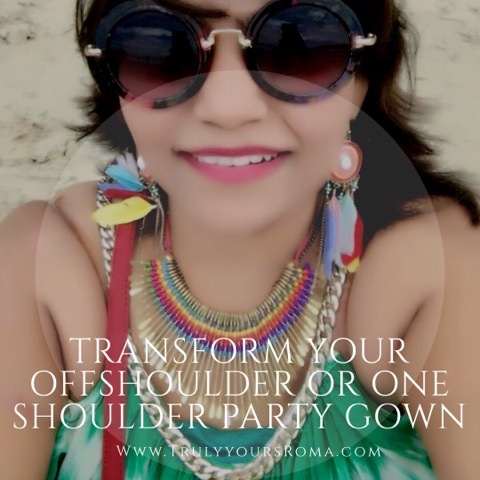 So what are you waiting for, grab one now. 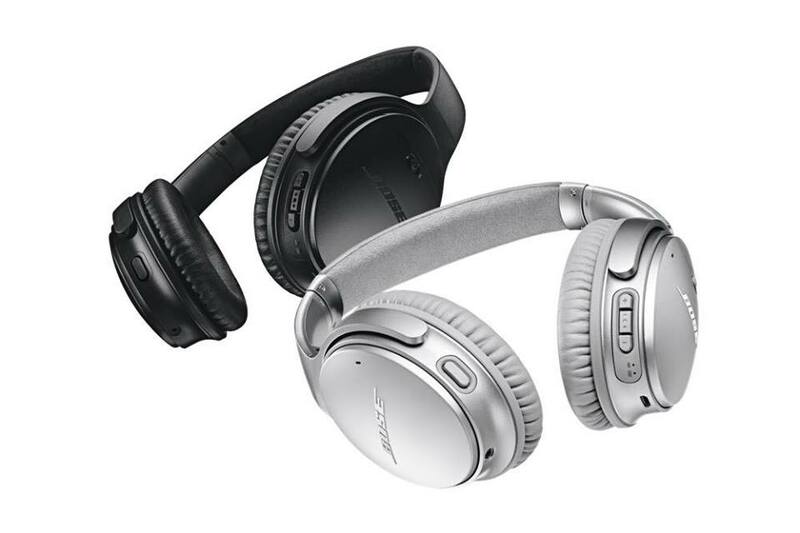 You can as well win them from us, by participating in our contest below. 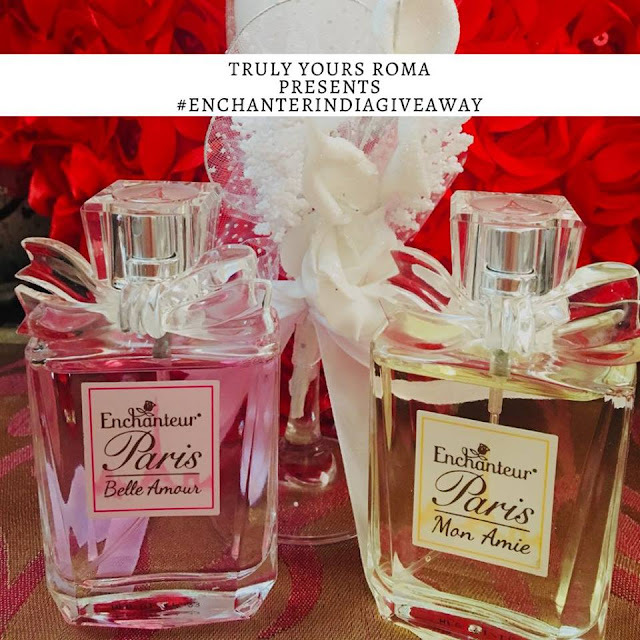 Yes, ♥️we present to you the Mega #EnchanteurIndiaGiveaway on Truly Yours Roma here, this Valentine’s Day♥️...The simplest ever contest to win priceless exotic perfumes from our sponsors ~ Enchanteur. 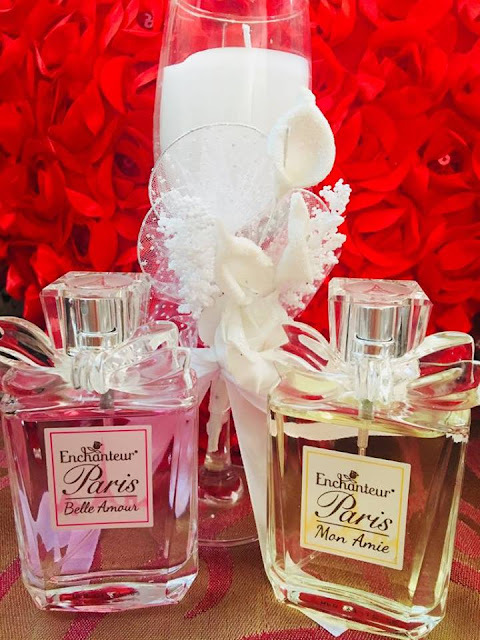 All you got to do is check their website here: www.enchanteur.in and let us know your favourite perfume that you would love to present to. your valentine. And did we say we have not one, not two but three winners in this mega #giveaway ♥️so get going. 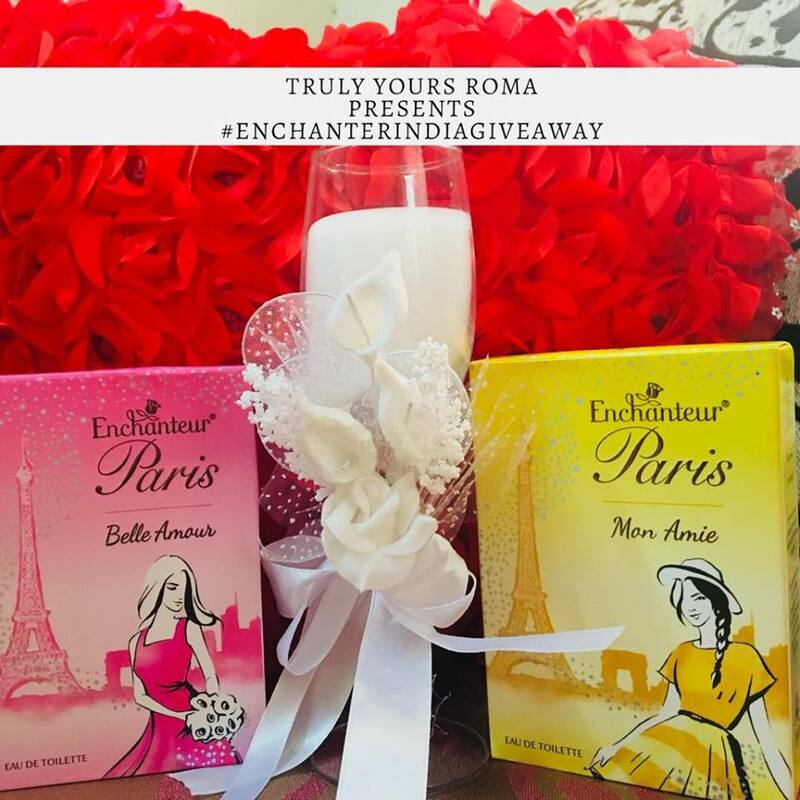 Please aid us track your entries on all channels by using the compulsory hashtags: #TrulyYoursRoma #EnchanteurIndiaGiveaway. Happy Valentine’s Day my precious Readers and Friends this contest is open for you all thru’ Feb♥️♥️♥️♥️.